Sometimes traveling at the last minute just doesn’t work out. But then sometimes it does. So. I was supposed to switch from hostel bunk to single room two weeks ago this morning. I had been informed when I originally made the reservation that the rate of $95 would include an ensuite bathroom. I was informed this morning that it was one of the rooms in the old building that shared the same bathroom as the hostel. You have to understand. I’ve stayed in one of those rooms before (about seven or eight years ago, when they cost what a hostel bunk costs now). It wasn’t worth what I paid for it then, for two reasons. One, the room had a horrible bedbug infestation (the bunks have always been clean), and two, that’s where I had a really frightening experience with what I’m pretty darned sure was — well, I’m not going into that here. Let’s just say that the only reason I was willing to pay $95 for a room was because I thought they were going to put me in the new part of the building. The new owner and I went round and round about it, and I ended up having him refund my credit card. But now I didn’t have a place to stay tonight, nor did I want to waste the day looking for one. So I drove back into the park figuring I’d make the best of whatever time I had left, and I’d head on out this afternoon to find somewhere to stay farther from the park before heading home tomorrow a little earlier than planned. Which all turned out to be a good thing. At least timing-wise this morning. I headed back out into the park, towards the geyser basins again, and decided my first stop on this cloudy-but-not-raining-yet morning would be at the Fountain Paint Pots. The Fountain Paint Pots. This early in the year, they’re kind of runny. The Fountain Paint Pots (and the long-gone Fountain Hotel, which was nearby) are named after Fountain Geyser, which is just off the boardwalk there. It was a geyser I’d always wanted to see, but it’s not officially-predicted, and I didn’t know then about the unofficial predictions, so I’d never seen it. So what do you think happened? Yup. Just as I walked up, it boiled over and started erupting. And if I hadn’t ended up wasting the time arguing with the owner of the Madison Hotel this morning, I’d probably have missed it — again. Glorious, glorious Fountain Geyser, which is much taller than it looks in this photo. The rest of the morning was still wonderful, if a bit anticlimactic. I mean, there’s nothing better than a new major geyser to add to one’s life list. But I stopped at all the usual suspects that I hadn’t wanted to get soaked over before — Midway, with the clouds of steam hanging over Excelsior and Grand Prismatic. Runoff looking back towards Grand Prismatic Spring. Biscuit Basin, with its glorious Sapphire Pool. Biscuit Basin’s Sapphire Pool, which erupted in 1959 after the earthquake. And Black Sand Basin, with Cliff Geyser, which is James’s geyser. The one where he finally found out where he really came from, in a brief timeslip one sunny October afternoon in 1959/1983 in Finding Home. James’s Cliff Geyser and hot spring runoff into Iron Creek. By then I was way overdue for a late lunch, so I waved farewell to my favorite place on the planet once more, already making plans for a hopefully longer visit next year, and stopped in West for KFC, where the manager was having her Chinese employee write something to do with the Fourth of July on the window in Chinese characters, for some reason. Want some Chinese fried chicken for the Fourth of July? I then headed northwest on U.S. 287 towards Earthquake Lake, which is, obviously, the site of the earthquake I mentioned yesterday that was part of Chuck’s time travel device in Repeating History. On August 17, 1959, a 7.3-7.8 (estimates vary) earthquake struck here and an entire mountainside fell, blocking the Madison River and burying a campground, killing twenty-eight people. The quake also did a lot of damage in Yellowstone, just a few miles east of the epicenter, and, incidentally, sent my hero Chuck eighty-two years back in time. Today it looks very peaceful, although the slide is still strongly evident fifty-five years later, and there’s an interesting, recently redone visitor center, too. The landslide triggered by the Hebgen Lake Earthquake, which created a new lake, and, unfortunately, killed 28 people in the process. By the time I got that far, it was midafternoon, and while I had a good idea of where I wanted to spend the night, I needed to get moving again. I drove down the Madison River valley and turned west on Montana 287 (as opposed to U.S. 287) at the town of Ennis. The Madison River Valley south of Ennis. You’ll note that the weather improved drastically as soon as I left the Park . I wanted to see Virginia City again. Virginia City, and the neighboring ghost town of Nevada City, are two of Montana’s earliest settlements, and I hadn’t been there since my Long Trip fifteen years ago. It’s a fun, touristy place with an interesting history as a mining camp (of course) where vigilantes dealt with the infamous Plummer Gang. Lots of false-front buildings and even a stagecoach offering rides, and plenty of historical markers. I spent a rather pleasurable hour or so there, before I climbed back in the car one last time for the day. Boardwalks of another kind, at Virginia City, Montana. Charley hated detachable collars like the one in this Virginia City storefront. Want a stagecoach ride, little girl? On my Long Trip (as documented in Cross-Country), I was desperate for a place to stay one night in this part of the world when I finally ran across the tiny town of Sheridan, Montana, and found a nice little place called the Moriah Motel. I was banking on it still being there, and it was. I think the same elderly lady was running it, too. It was reasonably priced and modern and that was all I needed. So some things do work out okay. But if a friend and I do go back to Yellowstone as part of our WorldCon jaunt next year, we’re going to make our reservations in January. “Smith traced the three recent earthquake swarms to the Hebgen Lake quake [in 1959 — my time traveling hero’s earthquake]. ‘These are a really related,’ he said. More earthquake. On this day we drove to Seward, on the east side of the Kenai Peninsula. I very carefully noted that the name is pronounced “soo-ard.” I don’t remember if this was another spelling/pronunciation disconnect that I disapproved of, but of course the town is named after Lincoln’s then Johnson’s Secretary of State who arranged for the purchase from Russia of the land that later became Alaska back in the 1860s for $7.2 million dollars, or roughly two cents an acre. He was greatly ridiculed for it at the time, and two of Alaska’s nicknames for years afterward were “Seward’s icebox” or “Seward’s folly.” I wonder what they’d have called it had they known how valuable all the oil found up there has been. I have a mental picture of the town of Seward as being a dry, dusty place, although that photo certainly doesn’t look like it. It may have more to do with the fact that the only campground we could find was behind a Tesoro gas station than anything else. Seward was another place hit extremely hard by what my diary calls “the great Alaska earthquake.” One thing we did there that afternoon was attend a slide show presentation at the town library of pictures of the terrible things that happened to Seward during the quake. Given Seward’s sea level location, it’s not surprising that a lot of damage was done by the tsunami that followed the quake as well as the quake itself. Just some of the damage from the earthquake. The whole thing was fascinating, if terrifying. I’ve been through a few earthquakes myself — it’s hard to live on the west coast of North America for any length of time without feeling the earth tremble occasionally — but the biggest quake I’ve been through was a six-point-something, and the worst thing I’ve ever seen happen personally from a quake was the glass roof of an old-fashioned greenhouse where I’d been working falling in behind me as I ran outside. After that I suspect the visit we made to the oldest Protestant church on the Kenai Peninsula wasn’t all that impressive. And, of course, we did our usual groceries and laundry. Today is Independence Day. We didn’t shoot any fireworks.” When I was growing up, fireworks were either something you watched being shot off at Disneyland (which was less than 10 miles from our house, so we could see them from my best friend’s roof — my father wouldn’t let us climb up on ours) or something you bought at a fireworks stand that my father set off at the end of our driveway on the Fourth. I think that’s the first Independence Day of my recollection where we didn’t have fireworks. No wonder I was disappointed. We spent part of the day exploring Anchorage. The most interesting place we went was Earthquake Park. The Anchorage city parks website does not seem to have separate pages for each park, which is unfortunate. Anyway, on March 28, 1964, which happened to be Good Friday, the Anchorage area experienced the second most violent earthquake in recorded history. 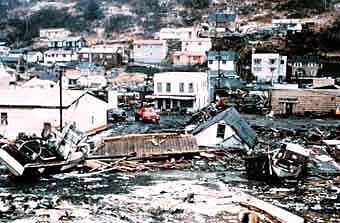 It was a 9.2 on the Richter scale, and destroyed a good deal of Anchorage and killed a number of people there and elsewhere, as well as causing tsunamis felt all the way down on the Pacific Northwest coast and damage across hundreds of square miles and to other communities in the region. What I remember of our visit to the park, nine years after the quake, is that the ground was still spongy. It literally moved under your feet when you stepped on it. There was a trail, with signs telling about the earthquake and its aftermath, which we followed. The weather was cool enough that it almost felt like winter to me, who grew up in Southern California, with the wind whipping in off of Cook Inlet. Supposedly you can see Mt. McKinley from the park, but we’d had our good viewing luck already. We were going to go to a museum that day as well (my diary doesn’t say which one), but it was closed because of the holiday. So we went back to my aunt’s and uncle’s house, and the rest of the day was spent being lazy. I took Gay for a walk, and my aunt took us for a tour of the base. And that was our second day in Anchorage.